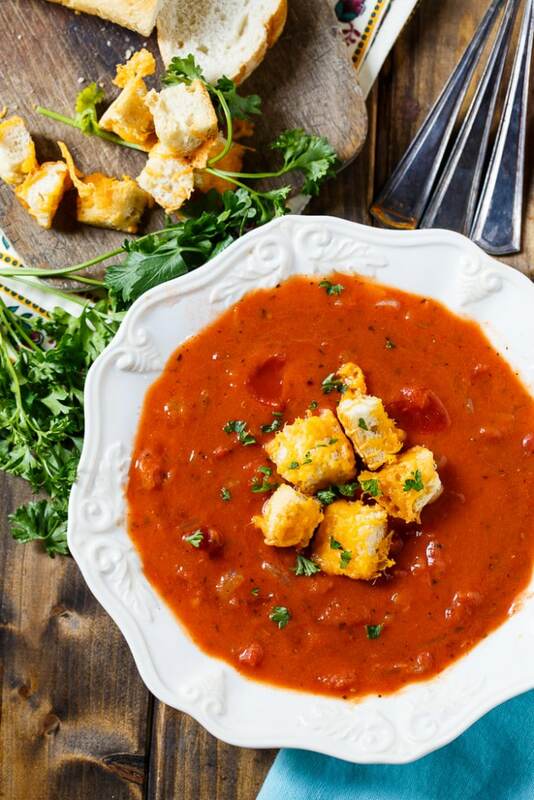 April is National Grilled Cheese Month and nothing pairs better with a grilled cheese sandwich than a warm bowl of tomato soup. 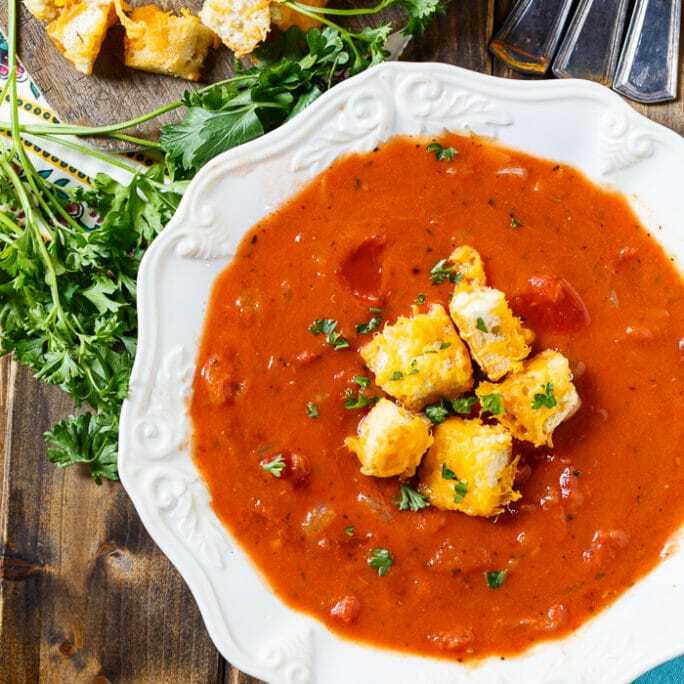 This Chunky Tomato Soup with Cheese Croutons is a quick and easy recipe using Tuttorosso Tomatoes. They are my favorite canned tomatoes and since they are picked at peak ripeness, anything you make with these canned tomatoes will taste garden fresh. 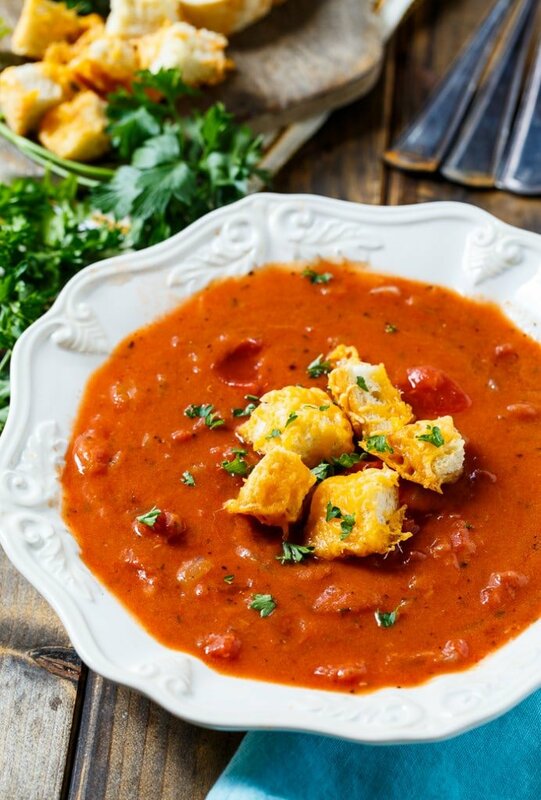 Chunky Tomato Soup can be made in about 20 minutes, making it perfect for a weeknight meal. It also reheats well for lunch the next day. This recipe uses one can of Tuttorosso Crushed Tomatoes with basil and one can of Tuttorosso Diced Tomatoes. I love that this tomato soup is both creamy and smooth and has a little texture contrast from chunks of tomato. And I really love that Tuttorosso Tomatoes are packed in Non-BPA liner cans and contain no artificial colors, flavors, or preservatives. Onion, garlic, basil, and oregano are all the seasoning this delicious soup needs. 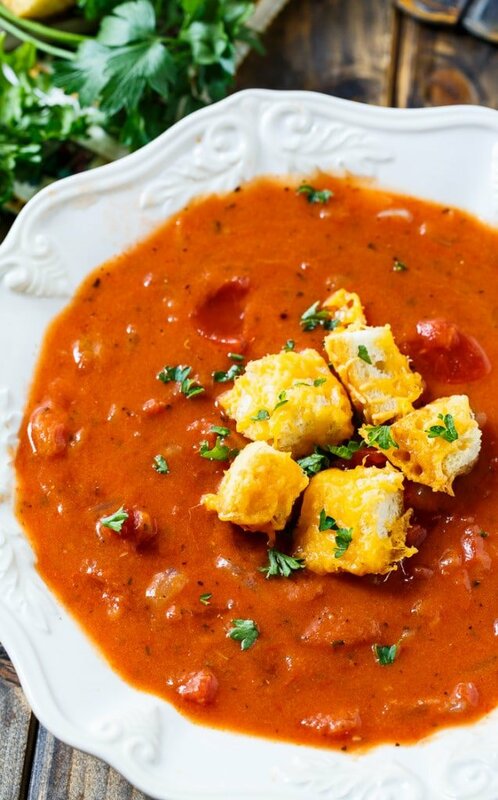 The crunchy cheese croutons are every bit as yummy as the soup and pair perfectly with it. Made from baguette cubes tossed in olive oil and covered in cheddar cheese, they are toasted until crunchy. 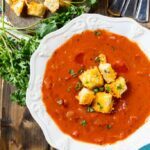 Chunky Tomato Soup is a simple but classic recipe that’s economical and can be eaten year round. For more tomato recipes visit Tuttorosso’s website. 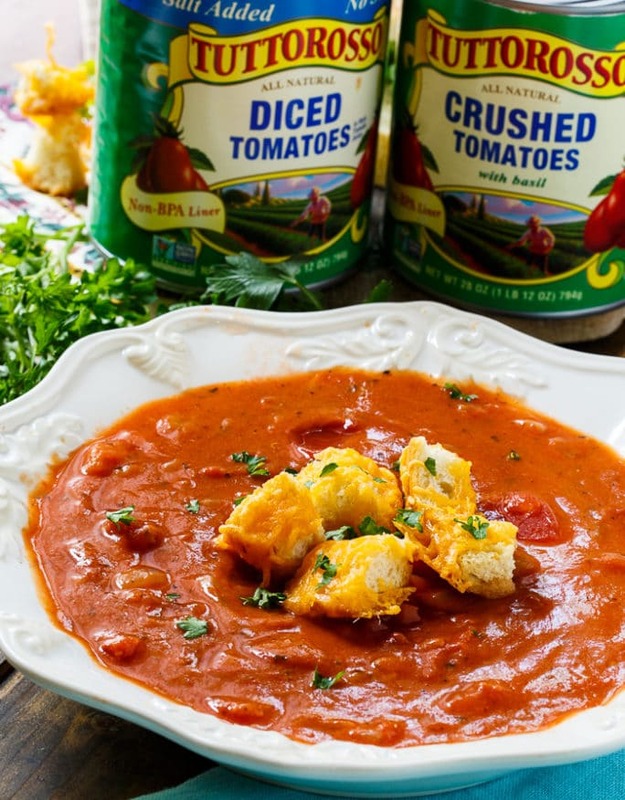 A creamy and flavorful tomato soup made from both crushed tomatoes and diced tomatoes. Heat oil over medium heat in a large saucepan. Add onion and garlic and cook until soft. Sprinkle flour on top. Cook and stir for 1 minute. Gradually stir in milk, and then both cans of tomatoes, basil, oregano, and chicken broth. Bring just to a simmer and cook for 15 minutes, stirring frequently. Cut baguette into 1-inch pieces and toss with olive oil. Place on a baking sheet lined with parchment paper. Place in oven and bake until crispy. Sprinkle cheese on top and return pan to oven until cheese is melted. Recipe slightly adapted from Tuttorosso Tomatoes. This is a sponsored post. All opinions are mine and I appreciate the opportunity to share products I love and use in my own kitchen. This entry was posted in Soups and Stews and tagged tomato, tomatoes. Bookmark the permalink. mmmm sounds like a winner!!!!! 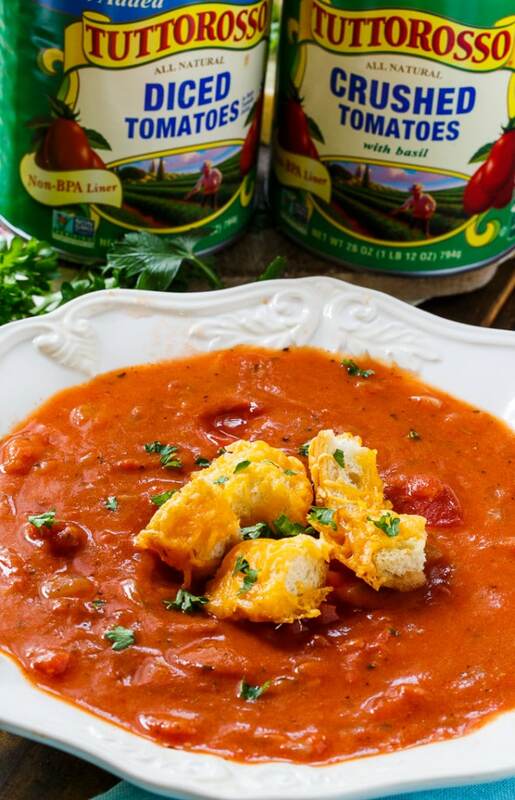 It is so brilliant to post a tomato soup recipe during grilled cheese month! Also love that this is a chunky version. 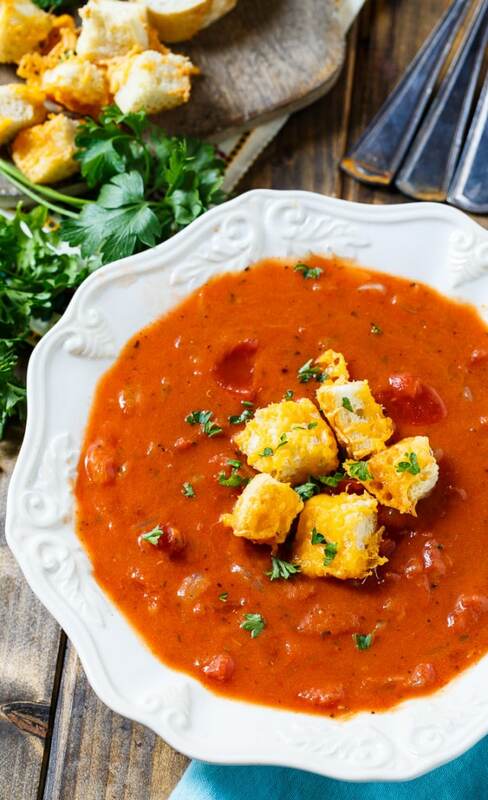 This is a total bowl of comfort right here, complete with those cheesy croutons! I love that your soup is chunky, too — I like it that way so much better than completely smooth! The perfect pairing to a gooey grilled cheese! Haven’t had tomato soup for ages! Yummy comfort food! I totally agree, nothing goes better with grilled cheese than tomato soup! This chunky version looks SO good, Christin! It’s cold here today, so I wish I had this to warm me up! What a wonderful idea to stir in some cheese with the croutons!